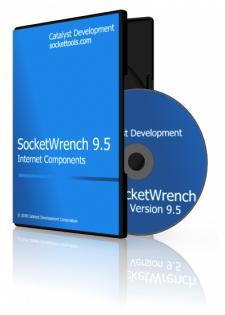 SocketWrench is suite of components and libraries that make it easy to add Internet functionality to your software. SocketWrench includes a general purpose TCP and UDP component, an TCP server component that enables you to easily create multi-threaded server applications, and a remote access services component to establish dial-up or VPN connections. SocketWrench is a general-purpose TCP/IP networking component designed to simplify the development of Internet client and server applications. Using SocketWrench, you can connect to virtually any service over the Internet, create your own custom servers, or integrate network functionality into your own software without being an expert in network programming. SocketWrench includes managed .NET classes for Visual Basic and C#, ActiveX controls (OCXs) for use with languages such as Visual Basic 6.0 and dBase, and standard windows libraries (DLLs) for use with C++ and most other Windows programming languages. SocketWrench is included within each of the SocketTools Editions but there has been an increased number of requests for SocketWrench to be made available as a separate product. As a standalone product, it is sold without our free support option, except for any Installation issues. Paid support options are available. If in the future, you choose to purchase a SocketTools Edition, your SocketWrench purchase price will be applied as a credit on your SocketTools purchase. Here’s a description of everything included with SocketWrench 9.0. The SocketWrench class is designed for the .NET Framework that can be used with Visual Studio 2005 and later versions, including Visual Studio 2017. SocketWrench provides full support for general purpose Internet programming and can be used to create both client server applications. Easier to use than the System.Net.Sockets classes, SocketWrench also includes support for secure connections using the industry standard SSL and TLS protocols. By simply setting a few properties, a secure connection using strong encryption can be established, providing your application with the greatest flexibility and highest level of security available. The SocketWrench .NET class interface was also designed to be similar to the SocketWrench ActiveX control, making it easier to migrate older Visual Basic applications to the .NET platform. The SocketWrench ActiveX control (OCX) is for development using languages such as Visual Basic 6.0, dBase and PowerBuilder. If you need to maintain legacy applications or prefer to use ActiveX components, SocketWrench offers a way to easily include Internet functionality in an application. In addition to supporting standard network connections, SocketWrench also supports secure, encrypted connections using the industry standard Secure Sockets Layer (SSL) and Transport Layer Security (TLS) protocols. As a lightweight ATL based control, SocketWrench has no dependencies on third-party libraries or the Visual C runtime, which means that there are no complex redistribution requirements. The SocketWrench Library includes a general purpose TCP/IP library that can be used with virtually any programming language to create client and server applications. It provides an interface that is much easier to use than the standard Windows Sockets API, and includes integrated support for secure connections using SSL and TLS. The Library Edition provides C++ classes, along with function declarations and constants for a variety of other languages, such as Visual Basic, Object Pascal (Delphi) and PowerBASIC. The SocketWrench libraries are high performance libraries with no external dependencies, and do not require COM registration. You can simply install them in the same folder with your application executable, without worrying about compatibility with other third-party libraries or additional redistribution requirements. A SocketWrench license includes free technical support by e-mail for installation issues, and access to support resources such as our knowledge base and online help. Technical reference documentation and example programs are included with the product. If you have critical support needs, you can also purchase additional support with your license. You can download a free, fully functional evaluation copy of SocketWrench that you can use for 30 days. Your evaluation also includes free technical support when you have questions. After you have purchased a license, you can use the SocketWrench components in as many projects as you wish, and redistribute your software to an unlimited number of users, without any additional runtime licensing fees.